Pickup from Delhi railway station/ airport and transfer to hotel. 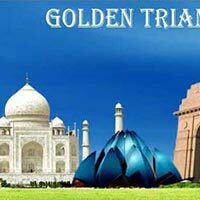 Check - in the hotel after fresh up proceed to sightseeing tour of old Delhi includes the visit to the magnificent Red Fort (closed on Mondays) built of red sandstone dating from the very peak of the Mughal power. Jama Masjid one of the architectural gift given by Shah Jahan. Jama Masjid is one of the largest mosque not only in Delhi but in India. India Gate, Qutub Minar, Lotus Temple and akshardhaam Temple. Overnight stay at Delhi. After breakfast check out from hotel and drive to Jaipur.En rout visit Fatehpur Sikri. On arrive Jaipur and check in at hotel . The rest of the day is free to explore this vibrant and colourful city. Overnight at Jaipur. After breakfast, drive to the Pink city of Jaipur, including City Palace in the heart of Jaipur is known for its blend of Rajasthani and Mughal architecture. Also visit Jantar Mantar, is the largest of the five observatories built by Sawai Jai Singh, Hawa Mahal and the Amber Fort situated just outside the city. You can have the unique experience of traveling on Elephant back to and from the top of the hill on which the fort is situated. In evening visit choki dhani. Night stay at Jaipur. After Breakfast drive back to Delhi. Upon arrival Delhi drop at Delhi Airport/Railway station.